Alanis Morrissette’s 1996 hit “Ironic” told us that irony included “rain on your wedding day.” It seems ironic that on Thursday, October 27, 2016, the day Horizon Goodwill was to celebrate a solar panel array, it rained. No matter, we moved the celebration inside. Our staff was very excited about the dignitaries who came to our event. We had Congressman John Delaney and Washington County Commissioner Terry Baker speak to us. 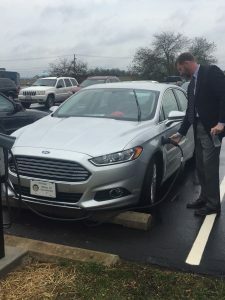 Hagerstown Delegate Brett Wilson spoke and furthermore was the first person to use our solar powered car charger. We also received commendations from Senator Mikulski and Senator Cardin, and Delegate Neil Parrott. This project will generate 1.2 million kWh of electricity per year, the equivalent of electricity used by 125 homes. 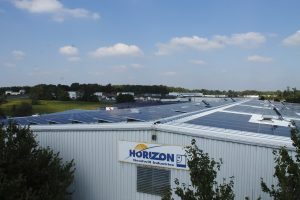 Horizon Goodwill expects to save over $950,000 in electricity costs over the next 25 years, enough to place an additional 60 people in jobs each year. Horizon Goodwill has been a leader in community sustainability since its inception in 1955. This project meets Horizon Goodwill’s objectives of removing barriers and creating opportunities for people with disabilities and other barriers to employment, as well as be a valuable asset to the community. A project this size needs a lot of people working together smoothly. Our Board Chair, Ron Bowers, spoke to the audience about the long journey the board started nearly three years ago to get us here today. 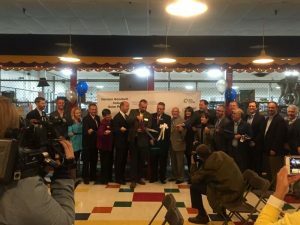 We heard from Nate Greenberg, WGL Energy, Don Baker – New Energy Equity, Jim Kurtz – RER Energy Group, and Bill Cole – Cole Roofing and Pfister Energy. Each spoke of the various parts of the project and how well we came together as a team to get it done. 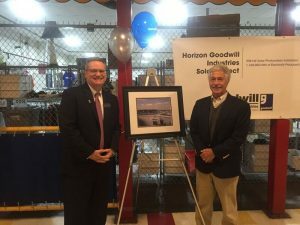 Don Baker, Co-Owner of New Energy Equity, presented a framed photo of the array to Horizon Goodwill.